Click here to visit the Suzuki Association website. Click here to find Lisa on the Suzuki Association website. courtesy of The Practice Shoppe: click here. Listen and play along to the traditional fiddle tune "Liberty," arranged by Lisa Deakins. Students Teach: Have students "teach" their dolls or stuffed animals how to play. 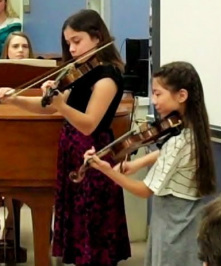 Ask the student to demonstrate songs, a proper bow hold, or playing position. Candle: Light a candle during each practice session, and over time when the candle burns out, the student gets a small reward. Violin Tour: Take the student “on tour” —playing something different in each room of the house (the big tone produced in the bathroom is very exciting! ), in a different place in the yard, or at different neighbor’s or relative’s houses. Recital: Plan a recital for stuffed animals, friends, and family, and make a program and decorate it. Practice for a week in preparation and let the child decide the pieces that will be played and what favorite snacks will be served. Set up a stage and make a spotlight! Dice: Roll dice to determine the number of repetitions of a piece or portion of a piece. Or, roll the dice to determine the piece to play. (Ex—1 = Pepperoni Pizza, 2 = Ice Cream Cone) Look for dice with higher numbers and different shapes for variation. Deck of Cards: Assign songs to each card. Have the student pick cards to determine the pieces to play and the order. Couch Pulls: Write the piece names on pieces of paper and attach a string or ribbon to each one. Attach string to a few pieces of candy or coins, and mix them together under the couch with ribbons sticking out. Have student pull a ribbon to determine the piece to play. You could also write techniques, like "10 bow circles" or "prepare playing position 5 times." Silly techniques can be included, like "play with your eyes closed" or "play while standing on one foot." Other silly options include "play with your tongue sticking out," "play using pizzicato," or "sing the piece while playing." Countdown: Have a countdown from your child's current piece and play all the way to the first variation of Twinkle. See if your child can recall which piece comes before another. Make a Video: Regularly record the student playing violin and watch it back with your child. You’ll both be amazed at the progress! Chip Game: Use “chips” (pennies, marbles, any kind of token). Set a goal—for example, keeping bow thumb bent while playing a piece or keeping a good violin posture for the entire piece. Give child and parent 5 chips each. If child meets the goal, take a chip from parent and give to the student. If student misses goal, parent gets a chip. Keep playing until someone has all of the chips. Tag-Team Playing: Have student hold the violin and parent holds the bow. The student can concentrate on fingers while the parent moves the bow. Read and Play: Start reading a book to your child (or child reads a book to you). After every 2 pages, put the book down and play 2 repetitions of a song. Then read 2 more pages, alternating between playing and reading until the book is finished.